Come out and support local talent as they come together for a night full of entertainment. Created from a simple dream Fashion Fest 478 was started to promote the local talent in our communities. 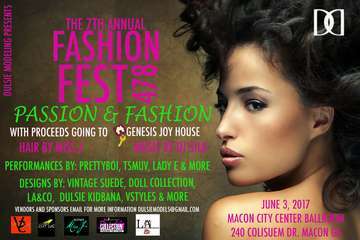 Pulling together Local Designers, Small Businesses, Independent Artists and Aspiring Models into one big show! A night full of entertainment, creativity, and design. Come out and support a night of Rhythm, Rhyme and Runway! !